I was at the market the other day. I’d gone for some sausages, but left with a handful of pig’s ears (more on which later), some pork belly, a ham hock, a kilo of mutton and a huge tray of beef ribs, about 5kg of mammoth ribs, each about a foot long and loaded with chunks of well-marbled beef. It was a good, but unexpectedly expensive trip. I had no idea whatsoever what I was going to do with those ribs, but they were one of those things that simply had to be bought. Mere details could be ironed out later. This sort of thing is very much in fashion these days … Leeds is scattered with places serving excellent beef and pork ribs, and barbecue-style food of all kinds is big business. The standard approach to beef ribs seems to be long, slow cooking, finished over a flame grill. There is normally a concoction of barbecue sauces and glazes in the mix, too. Faced with my mountain of raw beef, my feelings ran along the ‘if it isn’t broken …’ lines. This isn’t fast food. The whole process took nearly two days to complete, the result of a seriously long period of marinading butted up against a long time in a low oven, but the results were worth the wait. Beef ribs are huge. There’s no getting away from that – cows are big beasts, and their ribs match their stature. All the preparation needs to be done by the butcher – there’s no chance whatsoever that you’re going to be able to cut through a beef rib in a domestic kitchen. Your butcher has a saw for that. I made the mistake of not asking for the ribs to be cut down, so I was left with a side of ribs that were easy enough to separate out, but only into a clutch of huge, almost foot-long pieces, which really should have been cut in half length ways for easier handling. I tried to cleaver the bones in two, but it felt like the cow was just laughing at me – the cleaver just bounced off the bone. It didn’t really matter, and the comically large pieces of beef made an almost Flintstones-esque impact at the table. The process starts with a spice rub that flavours the beef for at least twenty-four hours, before four or five hours in a low oven and a further fifteen or so minutes over a charcoal grill. It isn’t labour intensive cooking, but it does need attention, especially during the long, slow roast, where an occasional baste is very much in order. The first step is a quick, but important one. The base flavour of the ribs comes from a pungent and sweet spice rub, that’s little more than a collection of dry spices mixed with sugar – two tablespoons of paprika, a tablespoon each of chilli powder, ground cumin and salt, a teaspoon or more of cayenne pepper, a teaspoon of celery salt and a teaspoon of ground black pepper. Add a good handful, at least a couple of big tablespoons worth of dark brown sugar – Muscavado would be ideal – and mix everything together. Taste some – there should be a fire there, a sweet, earthy fire of chilli and molasses. Smother the beef ribs, about five kilogrammes, with the spice rub, and lay them in a single layer in a roasting dish. Cover tightly with foil or clingfilm and refrigerate for at least a day, and preferably more. When it’s time to cook, tip the ribs into a roasting tin, add a wine glass worth of water to the tin and start to roast at around 150c, covered in foil to keep the steam in. Turn the ribs over every so often, and baste them as you do, topping up the water if it needs it. Three, four, five hours … whatever. It’s an unpredictable art that depends on the toughness of the meat, the temperature of the oven and the general feeling of well-being exuded by the cook. In my experience, just north of four hours is about right, just don’t rush it … this is relaxed, slow food that needs time to cook, partly roasting, partly braising, at its own, snail’s pace. The ribs are done when they’re tender to the point of a knife, and have shrunk back to reveal the naked bone within. About an hour before the beef is ready, pull together a quick barbecue sauce from half an onion, finely chopped and fried until soft with three cloves of garlic, a couple of tablespoons of dark brown sugar (Muscavado, again, would be perfect), three tablespoons each of cider vinegar and Worcestershire sauce, three-quarters of a teaspoon of ground black pepper and a long, leisurely squirt of tomato ketchup, at least three or four tablespoons. Bring this sweet sludge up to a gentle simmer, and let it down with a big splash of water, leaving it to bubble and reduce gently by about half. Add salt to taste, and adjust quantities of ketchup, Worcestershire sauce and sugar as you go. A good barbecue sauce has to have some of your soul in it, too, so being overly prescriptive about the quantities here is grossly stupid. While all this is happening, fire up the barbecue. The charcoal needs to be hot and ashen grey by the time the ribs hit the rack. Don’t be put off by the British idea that barbecuing is only for that hot day we sometimes get in early August. You can, and should, do it all year round. My barbecue is parked just outside the back door, and this is the day when the worst storms for decades are being predicted. It was a bit squally this afternoon, but the beef was perfect, and I didn’t get too wet. Brush the cooked ribs with generous amounts of the barbecue sauce, and grill them on all sides, continuing to brush with the sauce. The sauce helps to build up a rich, tasty char on the meat, which will blacken and singe at the edges. It’s a wonderful smell and an even better taste. 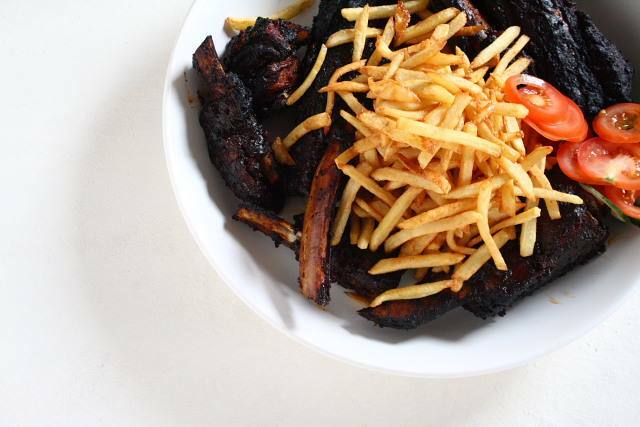 Serve the finished ribs with thin cut chips and a token salad that nobody will eat. Leftover meat makes astonishingly good sandwiches. With all the meats you bought and a few vegetables you could boil up a great hochepot, the hotchpot of the Flemish corner of France. It’s much better than the north English hotpot in my view. Lots of recipes online in French but some in English too. I once made one but it failed because dye in a green twist tie I used to tie some leeks leached into the boil and covered it with a green sheen! The whole thing went into the garbage. I must try this again. I do love that token salad! I did ribs the other day but in the slow cooker for about 5 hours with sauce but we have slow cooked them in the oven too (which is slightly better but requires involvement and not like we can pop home of a lunchtime). Must give beef ribs a try! And this is why I love reading your blog! (Keep up the) Good work.